Nowadays, more professional High Definition camcorder manufactors prefer to release camcorders&cameras with XAVC (.mxf) or XAVC S (*.mp4) output, like Sony PMW-F3, Sony PMW-F5, Sony PMW-F55, Sony PMW-F65, Sony FDR-AX1, Sony FDR-AX100, Sony NEX-FS100, Sony NEX-FS700, Sony HDR CX900, etc camera. XAVC uses level 5.2 of H.264/MPEG-4 AVC which is the highest level supported by that video standard. XAVC can support 4K resolution (4096 × 2160 and 3840 × 2160) at up to 60 frames per second (fps). XAVC S supports resolutions up to 3840 × 2160, uses MP4 as the container format, and uses either AAC or LPCM for the audio. There is no doubt that these camcorders or cameras mentioned above can capture outstanding videos. However, users of these camcorders always encounter video format incompatible problems while they want to preview XAVC/XAVC S files on Mac through QuickTime or make a further edit in some professional editors,such as Final Cut Pro/FCE/iMovie/AVID .etc. Actually, those high-compressed with high data rate XAVC/XAVC S videos are difficult to be recognized and supported by QT and various non-linear editing systems (NLE). So, what should we do for enjoying the XAVC/XAVC S video in Quicktime or loading the XAVC/XAVC S video on Mac for further editing? Converting XAVC/XAVC S files to mov on Mac, yes, it’s the easiest yet right workaround. To get the work done, UFUWare XAVC/XAVC S Converter is highly recommended. It’s a professional yet decent Mac XAVC/XAVC S to MOV Converter which can help you transcode XAVC/XAVC S to mov with several simple steps. Just do some clicks on your mouse with your finger, you can easily convert XAVC/XAVC S files to mov on Mac and then preview XAVC/XAVC S video with QuickTime or import XAVC/XAVC S video into FCP/iMovie for editing on Mac. Besides, it allows you to do some premiere editing work on Mac before transcoding including cropping, trimming, adding watermark, etc. The Mac XAVC/XAVC S Converter must be your best choice when you need a Sony XAVC/XAVC S Converter, you can do action with XAVC/XAVC S files at anytime anywhere now! Just download it and follow below steps to convert XAVC/XAVC S files to MOV on Mac now. Click “Add video” button to import the Sony XAVC/XAVC S files. Click “add from folder” button to add XAVC/XAVC S folder. Click format to choose HD Video > H.264 HD Video (*mov) profile in the drop-down menu. If you want to edit XAVC/XAVC S file in FCP, suggest you choose Final Cut Pro > Apple ProRes 422(*mov). And for editing in iMovie/FCE, you can choose iMovie and Final Cut Express > Apple InterMediate Codec(AIC)(*mov). P.S. 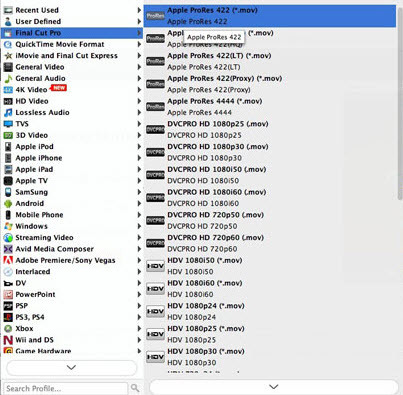 Besides transcoding XAVC/XAVC S to ProRes MOV, converting XAVC/XAVC S to AIC, UFUWare XAVC/XAVC S Converter for mac also support converting XAVC/XAVC S file to various video formats like AVI, MP4, WMV, MKV and converting XAVC/XAVC S to various devices like iPad, iPhone 4S, Samsung Galaxy Tab, Apple TV 3, etc. Click “convert” to start converting Sony XAVC/XAVC S file MOV format on mac. After conversion, you can watch your XAVC/XAVC S file on Mac or editing in FCP/FCE/iMovie without problem. 2. If you choose to convert XAVC/XAVC S file to Apple ProRes format, UFUWare will be able to keep the multiple audio streams separate in output file. Then you can get the audio tracks like original. How to Convert/Import Sony PXW-FS7 4k footage to FCP/iMovie/FCE?